April 15th is commonly known as National Tax Day (well, this year it’s April 17th). That’s the deadline for average Americans to file their annual federal and state income tax returns. But assigning one day with that title is misleading, because EVERY day is Tax Day—especially for New Yorkers. On top of all the taxes we pay from our incomes throughout the year, we all face a myriad of other taxes and fees. They’re everywhere and in nearly everything. New York has been clever about hiding them. They include: sales tax (8%), property tax (1.8%), taxes within cable and mobile phone bills (25%), taxes on electric and gas bills (50% higher than the national average), hotel taxes (5.9%), airport fees and taxes ($30 fee at JFK), alcohol ($0.14/gallon for beer, $6.44/gallon for liquor) and cigarette tax ($4.35/pack), gas tax ($0.62/gallon), car registration fees ($75 and up to $25/year), tolls on roads and bridges (between $5 and $15), dozens of taxes on health insurance and healthcare expenditures, and many, many more. While most people in our country face these taxes and fees, New Yorkers get hit harder than anyone else. Several independent studies have recently shown that New Yorkers have the highest tax burden in the nation. And it isn’t even all that close. 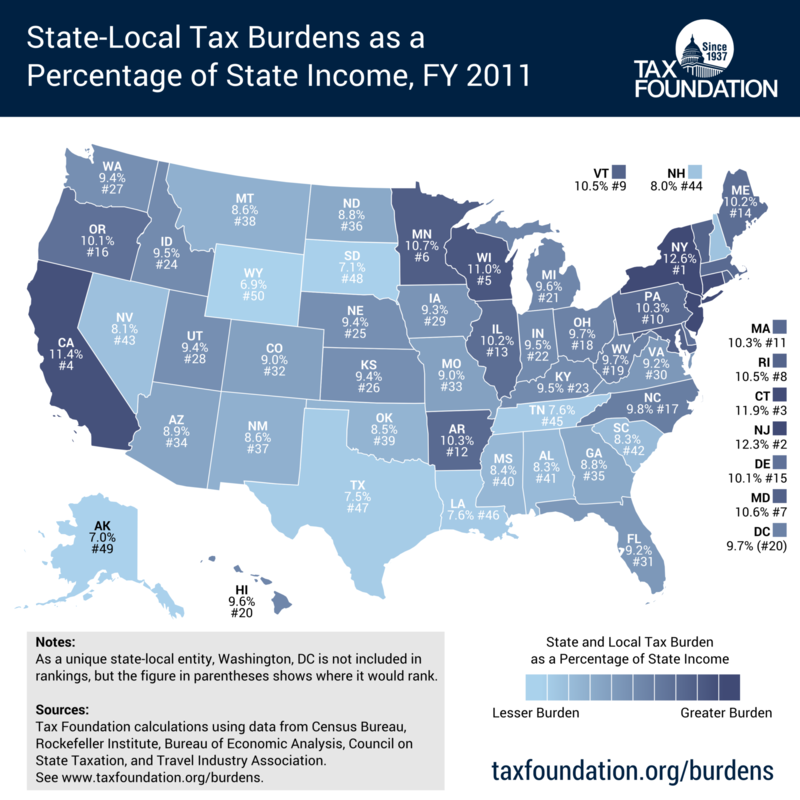 To demonstrate this in another way, the Tax Foundation has calculated each state’s “Tax Freedom Day”—the day when the average taxpayer has earned enough to pay his or her share of taxes for the year, including federal, state and local taxes and fees. After that date, you get to keep all your own money. So, earlier is better. The national average Tax Freedom Day is April 19th. The best state is Alaska, whose relatively low taxes allow them to celebrate theirs on April 4th. New York is, by far, the worst. Our Tax Freedom Day is May 14th. That’s 11 days later than any other state. The reasons for this are pretty simple: our state’s spending has been rising quickly, while people are leaving the state. More cost spread over fewer people. And it’s getting worse. Sadly, we’ve ranked in the top three in the statistic of most moved-out-of-states for the seventh year in a row. As history has shown, people flee wars and bad government. For example: refugees fleeing war-torn Syria, Cubans floating to Florida, North Koreans running through the DMZ and away from Kim Jong-un. And now people are fleeing New York state. Having the highest taxes and so many people leaving our state is no coincidence. They are cause-and-effect. People are leaving New York because of the high tax burden, the ever-growing set of rules and regulations and because those taxes are squandered by our corrupt and incompetent politicians in Albany. None is worse than Governor Andrew Cuomo—who’s presided over New York for those seven years. The source of the problem is spending, of course. Spending on incompetence, waste and corruption. And since New York can’t print its own money or borrow endlessly, the money has to come from taxpayers in New York. But most New Yorkers have had enough. Many are leaving. Those who stay need to demand change—deep spending cuts to permit deep tax cuts. These changes, along with a slashing of rules and regulations, will attract people and businesses to our state—further diminishing the tax burden. It’s time to demand change! NY Issues cuomo, tax day, taxes. permalink.